My superpower, if I could be said to have any, is being supremely ordinary. Yeah, I’m really, really good at that. Now, you may think it’s not impressive that I’m good at being so-so, and you could be forgiven for thinking it. And yet . . . Besides that it requires massive numbers of us mid-range sorts to keep nature in a sort of balance with the various human outliers at the top (and bottom) of the spectrum, there’s also the comfort and safety of being able to travel under the radar of scrutiny and pressure to which both kinds of exceptional people are exposed. What on earth does this mean I am good at doing, at being? Why, I do what’s expected. I go to sleep; I wake up. I eat and I walk and I get dressed and undressed, and the world carries right on around me. And though I don’t at the moment have employment outside of our home, my current occupation being Homemaker, I spend myself and my efforts, rather, on doing the small and yet significant things that might not be essential to keeping the world operational but grease the gears, instead. And keeping the cogs working relatively smoothly is as useful in its own way as being the driver, the engineer or a cog myself. I go to meetings and do Projects, too, to be sure, but mostly what I do nowadays is fix a meal, repair a door-jamb, ferry my spouse and a student to a rehearsal. I do laundry; I prune the plantings near the window. Glamorous? Just exactly enough. Because the luster of the day comes not from being admired and lauded but from being appreciated, even if it’s hardly necessary to hear that announced constantly–after all, the proof of its value is in plain view if the needful things get done. Any reward lies in the belief that I make life that one tiny iota smoother and pleasanter for that one brief instant, even if only for this one other person. It’s borne on the smile of relief worn by him whose sheaf of office paperwork got filed at last when he couldn’t get to it himself, or whose old slippers have been mended by the time he gets home from the office at the end of the day. It’s in the neighbor being glad to have the excess garden supplies or box of art materials I’ve collected to send to school with her. It’s with me when I arrange the chairs alongside the singers before a rehearsal when I come by to listen to their work. It’s mostly in knowing that the stuff needed to keep quotidian action on course is being looked after, bit by little bit. And that I’m the person for the job. I don’t do this selflessly, of course, because I would hardly keep it up for long if it weren’t so simply and inherently rewarding. And it certainly bespeaks no genius or courage on my part that I do it, for clearly it takes greater skill and ingenuity and bravery to do all of the shiny, showy things for which I provide my atoms of encouragement from the periphery. Maybe a jot of courage only to admit to being a homemaker and loving it. So many who haven’t the privilege of the life seem to disdain it and misconstrue its meaning, especially if it doesn’t have either children or wealth as part of the equation. I am far more fearful of having no sense of purpose than of being thought unimportant by anyone else; I care more about feeling my own worth than having it validated by any outside agents. So if I seem to anyone to be afraid of taking a larger role in the Real World as they see it, I suppose I ought to admit that in one sense I am. I know that having this Job for a few years has given me new strength and the ability to go out in the wider world for a so-called Real one again when the time comes, yet I do dread leaving this role that has given me a feeling of vocation more than anything else I’ve ever done and risking the dimming of any of the self-worth I’ve garnered or the value I’ve learned to impute to the tasks of being normal and simple and everyday, which I’ve learned to see as so much deeper and richer than they’d seemed until I tried on the role of their custodian myself. I do, at the end of it, think that if I’m a dull, bland or unimportant grease-monkey to the cogs of the world, I’m a damn good one, and if I’m scared of giving up that high honor, then I at least credit myself with being a superior variety of chicken. This entry was posted in Aging, Animals, Art, Business, community, Education, Family, Food, Gardening, History, Housekeeping, Human Nature, Maintenance, Thinking Aloud, TIme and tagged accolades, art, being chicken, brave, chauffeuring, chicken, childless, children, Cooking, courage, daily, do the right thing, Drawing, Employment, everyday, excellence, exceptional, extremes, fearful, heroism, Home, homemaker, housekeeping, job, kudos, Laundry, median, middle class, Mixed media, ordinariness, Outliers, Photography, pressure, quotidian, recognition, rooster, Superhero, superpowers, support, wealth by kathryningrid. Bookmark the permalink. No chicken you (although you draw a magnificent one)! I love you, my dear! Well, I’d rather be known as a chicken than as a turkey, I guess. 😉 I love you, too, my sweet!! You are so generous, dear Annerose! 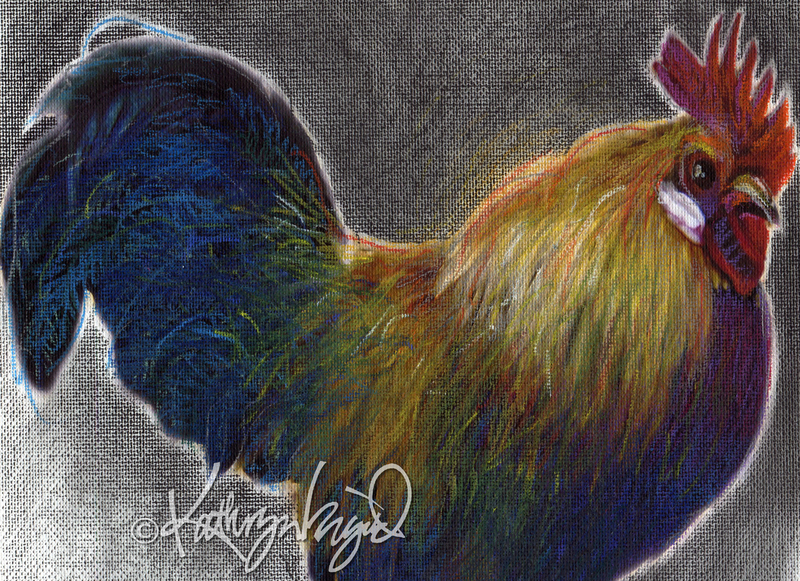 With your lively brushwork, I can imagine you’d do fantastic chicken portraits–have I just missed seeing them? ?